Social contests are a great way to increase engagement, reach, followers and leads. You can run social contests on a variety of platforms such as Facebook, Twitter, your website - all while being mobile compatible. Having great social media contest ideas and examples is the easiest way to get started. In this article, I'll give you 6 of the leading social media contest ideas, break down how you can run a social contest for your business, and deliver some proven contest prize ideas. With a Vote Contest, you can gain interaction with your supporters by asking them their views, and your supporters get to take action by voting. Putting on a Vote Contest is a great way to show you listen to your fans. This social media contest idea is extremely simple to set up on your Facebook page or blog. Vote Contests have a low barrier to entry – all voters need to do is click “Vote” and enter their email. Then they get to share their views by clicking on their vote option preference. You get to collect entrants’ emails, and you can track results in real-time to monitor campaign performance in our Social Marketing Suite. Once a fan votes, a post is automatically shared on their Facebook profile, inviting their friends to vote their view too. This generates buzz for your campaign and creates a potentially viral campaign for your business. Photo Contests are another great way to increase social media engagement. With a smartphone within reach at all times it seems like we are all passionate about photography these days. And everyone likes to shares their photos. The Photo Contests through Wishpond are very simple to set up. They have a relatively low barrier to entry, with fans simply submitting their email and uploading a photo. Photos are some of the most viral content on social platforms. Photo contests can also create buzz with your Fan's family and friends online, thereby increasing the reach of your brand to new people. Photo Caption Contests are a great social media contest idea to engage fans. They often stimulate competition when entrants get passionate. Photo Captions can be a lot of fun for both the entrants and the business running it. There is generally little creativity involved in a Photo Caption Contest, but they have a low barrier to entry. Users submit and vote on captions (titles) for photos. Once submitted, entrants automatically share a post on their Facebook profile, inviting their friends to join too. This generates buzz for your campaign and creates a potential viral campaign for your business. Sweepstakes are the simplest type of contest. They can be set up in minutes and, like all of our apps, are automatically optimized for mobile. Users simply click ‘Enter Sweepstakes’, submit their email, and they’re entered to win. Once signed up, entrants can share a post on their Facebook profile, inviting their friends to join too. This generates buzz for your campaign and creates a potential viral campaign for your business. Like all of our contests, you get to collect entrants’ emails, and you can track results in real-time to monitor campaign performance in our All-in-One marketing suite. 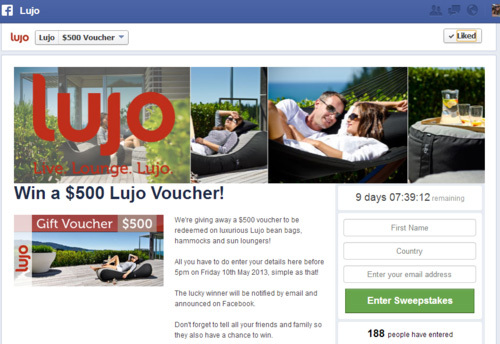 In the contest idea below, Lujo has set up a Sweepstakes to give away a $500 voucher towards their bean bags, hammocks, and sun loungers. To enter, contestants easily enter their email,first name, country, and email address. It’s best to have the prizes of your contest be relative to your industry. Gift cards and vouchers are easy, versatile prizes to give out. We have also written a post on nice prize ideas that your business could make use of. Essay contests ask more of your supporters, as you are asking them to express their views in words. Setting them up, however, is as simple for you as all our other apps. With an essay contest, you can ask your supporters what makes them passionate about your cause. You can ask you fans if there a story they would like to share, and to give them a chance to make their voices heard. This not only gets your fans and followers more involved by knowing you want to hear from them, and to share their stories, you also are able to showcase this written passion, which may ignite a flame in others. You can create prizes for the best essay, using those with the most votes (by getting the most votes, entrants are more motivated to share their essay through all of their social platforms, and their friends). Prizes don’t have to cost much if you are a smaller business, they could be as simple as spending a day with those who you help, recognition by posting it on your website, and/ or a gift certificate related to your cause or target market. Video contests are another easy to set up app. They can be used on your Facebook page and/ or embedded on your website. They are mobile compatible, and have auto-sharing by entrants. Video contests, like essay contests require more effort from your entrants. They can be very motivating, too, for those who are passionate about your cause. And, like the essay contest, they can provide a spark in others, which may ignite a passion for your cause. Again, like all of our apps in Wishpond’s All-in-One Marketing suite, you are able to easily collect participants emails in a exportable database. A "It's Better to Give than Receive" contest, where you enable people to donate money in return for a thank-you card from a food bank. Hopefully this article has given you a better idea of what a social media contest can be, and how to run a successful one. If you have any questions about any of the ideas in this article, don't hesitate to reach out in the comment section below!